Blend, crush, chop and more! Quickly blend up a smoothie, crumb a pack of biscuits for a cheesecake, puree vegetables and so much more! A must-have appliance for every kitchen, the Russell Hobbs 650W Stick Mixer makes cooking simple. 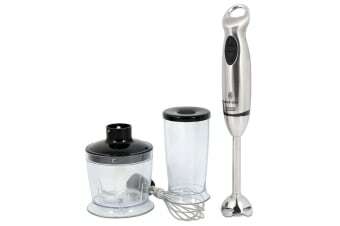 With the touch of a button, you have the power to blend, crush, chop, puree and whisk! The heavy duty stainless steel blades have been designed to chop and crush through the toughest of ingredients, including nuts and ice-cubes. Feel like a sweet treat? Mix together some cake mix or crush biscuits for a cheesecake. And when you’re done, simply place the bowl and attachments into the dishwasher for the quickest of clean ups! Really well made, quality product. Great present. Recipient of gift seemed happy.